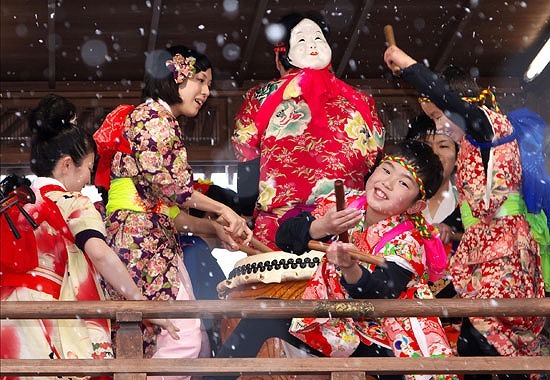 Known as the harbinger of spring, the Katsuyama Sagicho Festival is held annually on the final Saturday and Sunday of February in all 13 districts of the old Katsuyama-machi area. The festival dates back over 300 years to when the Ogasawara clan entered the Katsuyama domain in the Edo period. Characteristic of the festival are 12 yagura turrets erected around the town where men and boys dressed in long, red kimono dance to the sound of shamisen, flutes, and bells, while beating taiko drums all day long. Of all the sagicho across Japan, their unique humorous actions and dancing to the light tempo of the music is something that is only found in Katsuyama Sagicho. 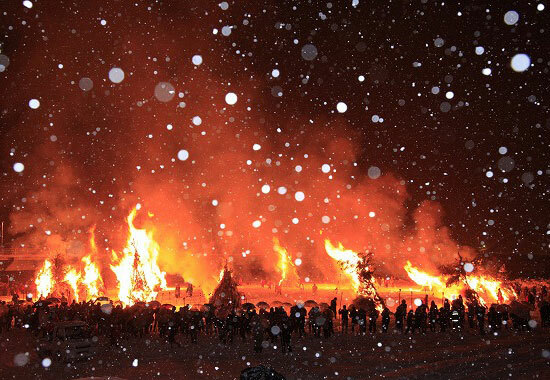 The Dondo Yaki, which marks the end of the festival, involves lighting a fire to pray for a good harvest and the extinguishing of fires; the flames blaze up high. The information below is referenced from 2019.